I don't bake sweet treats at home anywhere near as often I as should, which I supose makes the name of the blog a misnomer. Kate the bake comes from me being a baker by trade rather than writing a blog full of baking recipes. Perhaps I should include more baking recipes to rectify this. and have used a mixture of rice and maize flour, but you could add gluten free grain flakes for a bit of texture and vary the spices depending on the fruit. 400g (4 small) dessert apples, peeled, cored and chopped. Put the fruit in a pan with a splash of water (a tablespoon or so) and let simmer over a low heat for 5 minutes. 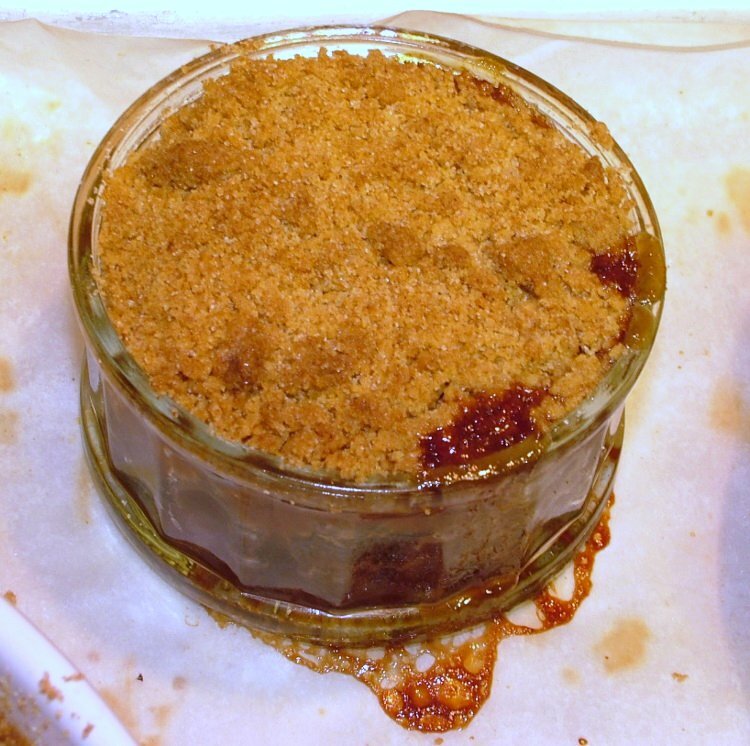 Taste the fruit & sweeten with dk brown muscavado (turbinado sugar) or agave nectar if very tart. Add the zest and vanilla extract, stir through. Pour the fruit into a baking dish - I used several small dishes for individual portions but I guess that an 8" or 9" square ceramic dish would be fine. rub in as if you were making pastry until you have a sticky bread crumb mix ( you can do this in a food processor). spoon the topping over the fruit in the baking dish creating a thick even layer. Place the baking dish on a lined tray to catch any drips. 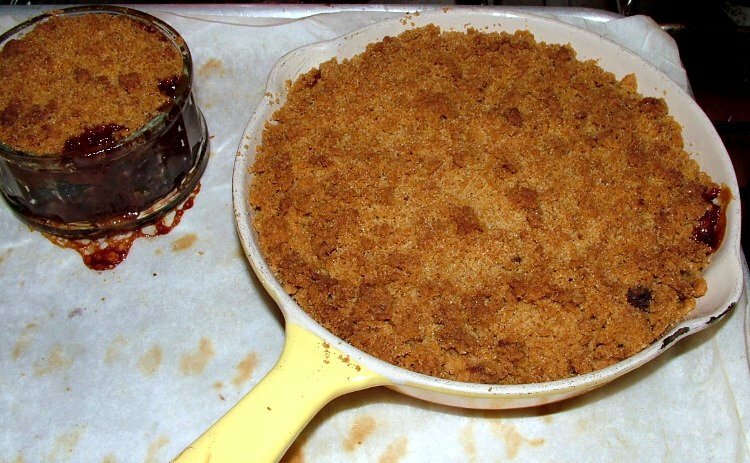 Bake in a preheated oven for around 40 mins at 190 deg C, until the crumble is browning on top and the juices are oozing up the sides of the dish. Serve with whilst still warm just as it is or with yoghurt, cream, custard or ice cream. What a good idea using the fruit from your liqueur. I've got some redcurrents soaking in vodka at the moment, so perhaps I shouldn't just chuck them on the compost heap. Choclette, not the compost heap! 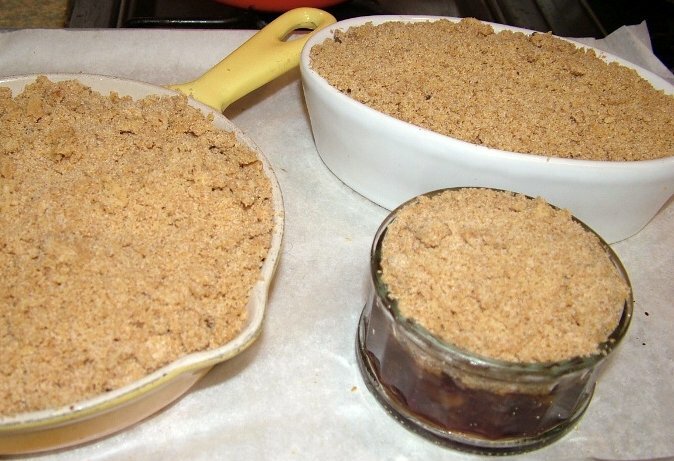 Redcurrant and orange crumble or tarts? I haven't tried this (never made redcurrant vodka either!) but you could use them as a base for a boozy sauce for xmas. I would try the red currants plus whole spices (cinnamon, star anise, black pepper maybe) plus orange juice, sugar and a bit of the flavoured vodka. Heat it up together & leave to infuse. You could freeze the sauce and defrost for xmas.